← This weekend: it’s POE FOREVERMORE! We’re off to Baltimore! With the recent release of the new film, The Woman in Black has been much talked about. The original Hill is certainly a classic, as it deserves to be. But it’s also a play, and if you love ghost stories and haven’t read it, this piece is certainly worth reading—and owning. I spent many years in community theatre both as an actress and stagehand, so for me, reading plays isn’t difficult. Reading plays and feeling true emotion while doing it, however, sometimes can be—stage directions in the script can provide a disruption in the flow of the work. Although the descriptive passages spoken by the actors in The Woman in Black certainly do their part in sending chills up the spine, in this case, it’s the stage directions that make this thing scary. The Woman in Black—A Ghost Play succeeds as a straight read because the simply-described desired movements of the actors create an easy image in the reader’s mind—images that will, more than likely, haunt the reader for quite awhile. 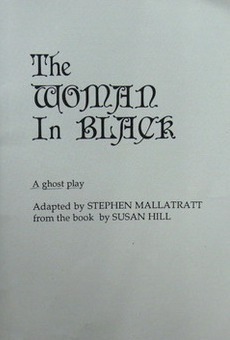 Stephen Mallatratt, adapted from the book by Susan Hill, The Woman in Black—A Ghost Play, (New York: Samuel French—London, 1998), 40. Posted on March 1, 2012, in GhoStory Guru and tagged Ghost Stories, Stephen Mallatratt, story analysis, Susan Hill, The Woman in Black, The Woman in Black play. Bookmark the permalink. Leave a comment.